We are in the midst of celebrating International Nurses Week, which culminates on May 12 with the birthday of Florence Nightingale. Although our founding mother of modern nursing would be impressed with the health technology of today, I am sure she would be sorely disappointed by the ongoing invisibility of nurses, which she fought so hard to overcome during her lifetime. Everyone knows someone who is a nurse. In addition to health clinics and hospitals, we work in your children's schools, at your workplace, in all branches of military service and in your places of worship. There are more than 3 million registered nurses in the United States alone. 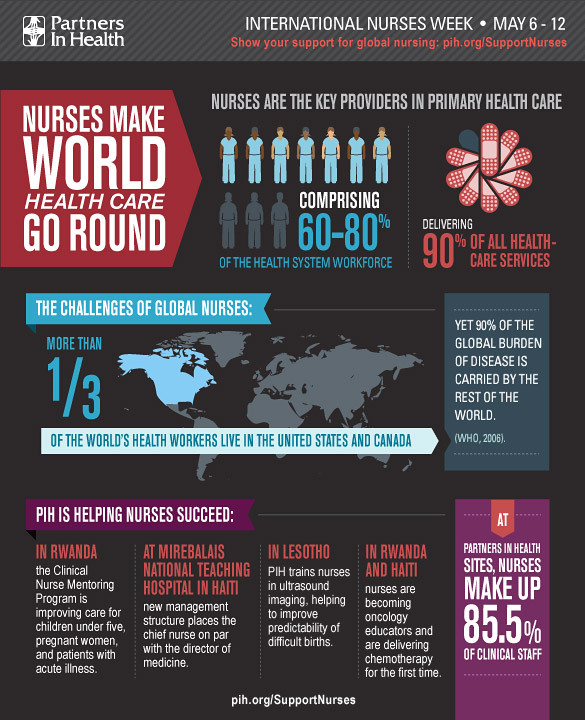 But the vast majority of nurses -- over 32 million of them -- work in other parts of the world. It is in poor countries and communities, where health needs are greatest and physicians are scarce, that nurses take an even greater role in healthcare delivery, often serving as the sole providers in rural villages or urban slums. For a mother in labor in the mountains of Lesotho in southern Africa or for a child suffering from cholera in Port-au-Prince, Haiti, access to qualified midwives and nurses often means the difference between life and death. We work with patients at every stage in their lives, from birth to death. We deliver babies safely with few if any resources; and we are often the people who are there to make sure that an individual can die in the most dignified and pain free way possible. We know what our patients and communities need. But although nurses deliver 90 percent of all healthcare services worldwide, they remain largely invisible at decision-making tables in national capitals and international agencies. Their absence constitutes a global health crisis. In key meetings where global medical and public health experts and international donors map out global health efforts and priorities in prevention and treatment, nurses who provide the vast majority of care are rarely included. The International Council of Nurses has highlighted the severe lack of nurses in leadership positions at the World Health Organization. The WHO human resources annual report of 2008 revealed that over 90 percent of its professional staff are medical specialists; less than one percent are nursing specialists, even though nurses make up over 80 percent of the global healthcare workforce. At Partners In Health (PIH) we are working with partner organizations and national Ministries of Health to strengthen nursing efforts and raise nursing visibility across the board. We have an incredibly strong, hard-working, and inspiring group of nurses who serve as colleagues and teachers in their home countries, as well as throughout the global community. These are the experts to whom I turn for answers to global health delivery questions. In Peru, nurses like Dalia Guerra serve as the cornerstone of a program that has achieved the highest cure rates in the world for patients with multidrug-resistant tuberculosis. In Haiti, nurse Beatrice Romela is creating a community of Haitian nurse leaders, and in Rwanda, nurse Manzi Anatole directs a program that is providing mentoring and supervision for nurses at rural health clinics. And at Mamohau Hospital in rural Lesotho, lead midwife Maphaila Mabathoana works tirelessly to make sure women are able to have safe labor and deliveries. Many of our partners in the United States and around the world have made substantial commitments to nursing. We need more partners like them. In one of the most innovative initiatives global health nursing has seen, the Dana Farber Cancer Institute has supported the creation of a nursing oncology partnership with Inshuti Mu Buzima (IMB), PIH's sister organization in Rwanda. Four experienced oncology nurses have committed to working alongside local nurses and physicians at IMB for three-month rotations, creating an unprecedented opportunity for Rwandan nurses to develop the specialized skills and experience needed to raise the quality of oncology care. In another groundbreaking initiative, Regis College in Massachusetts has partnered with the Haitian Ministry of Health and PIH to tackle the nursing education shortage in Haiti. The partnership has developed a comprehensive three-year master's program for 12 Haitian nursing faculty members. These nurse leaders will graduate from a public Haitian university with a master's degree that will enable them to take the lead in educating a future generation of nurses in a country where they're desperately needed -- both to improve the quality of care and to bring essential knowledge and perspectives to the decision-making process. These long-term, grassroots initiatives are shaping the new face of nursing in global health. With the investment of the global community in nurse training, mentorship, and leadership, we can make enormous strides in strengthening health systems. International Nurses Week is a time of reflection, celebration and hope. I am proud to be part of a strong community of nurses at Partners In Health. If Florence Nightingale saw our nurses providing compassionate care to millions of people in the poorest parts of the world, I think she would be proud as well. Follow Sheila Davis's blog, Global Nursing Voices, at www.PIH.org.